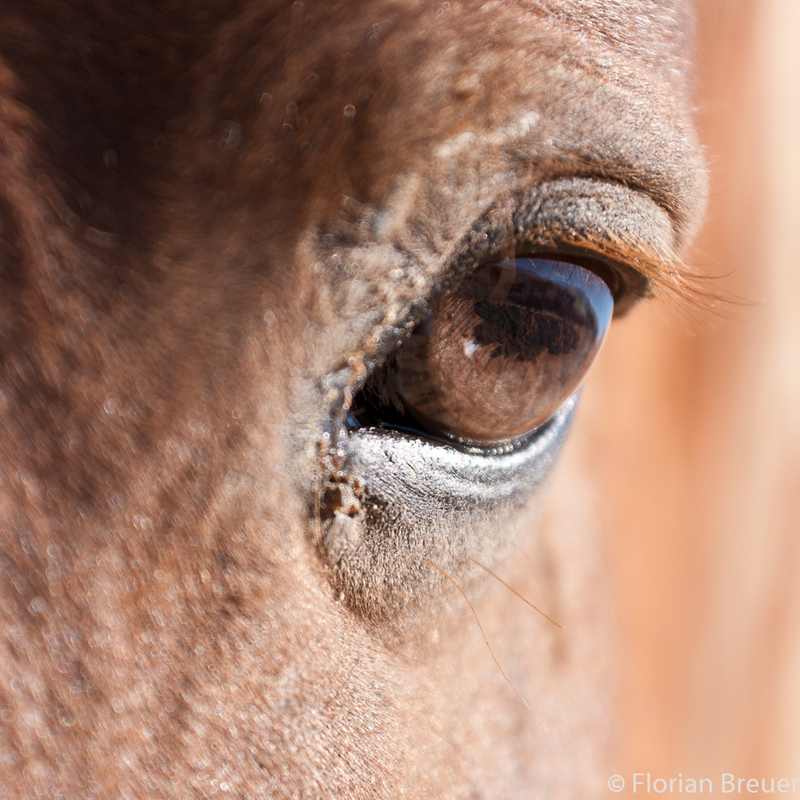 The eyes are the windows to the soul, the old saying goes. Well, this soul is a free one, a wild desert horse living on the Garub Plains in the southern Namib desert. 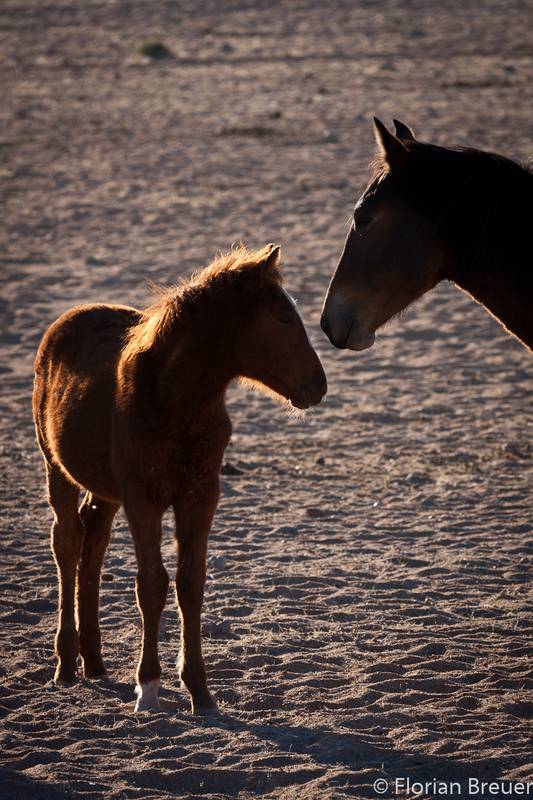 They are the descendants of horses that went feral around the time of the First World War. Their range is centred on the artificial Garub Station water hole, on which they rely for survival. 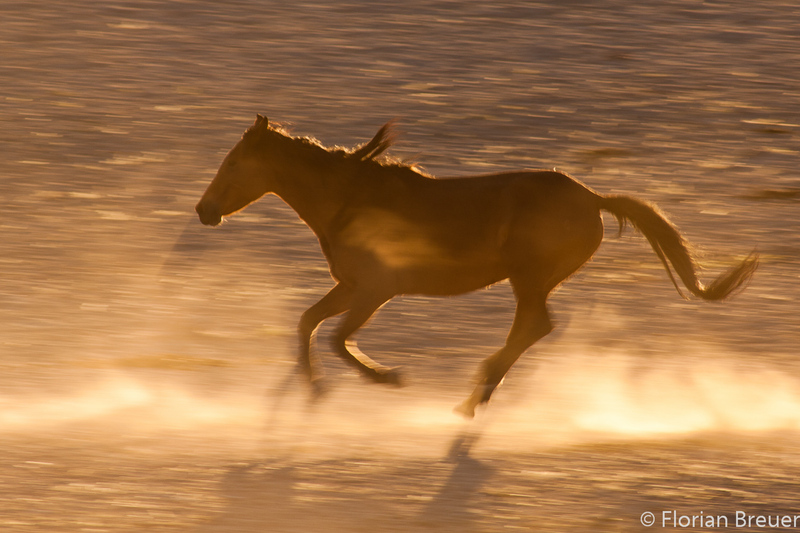 This was taken during the amazing Aus Workshop, run by Wicus Leeuwner and JJ van Heerden (they're not paying me to advertise, I'm just really enthusiastic), and photographing the horses at first light is one of the main attractions of the workshop, indeed of the whole area. What amazed me is that, despite living completely free for many generations, these horses still have their bred-in affinity for humans. 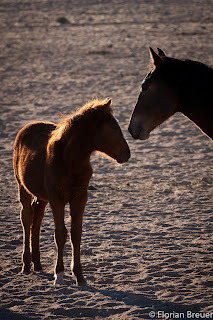 After drinking their fill, the horses mill around the water hole and socialise with each other, offering many photo opportunities of sparring stallions and suchlike. They are not bothered by photographers getting too close, and in fact some of them come over and demand attention, like the one in my title photo. 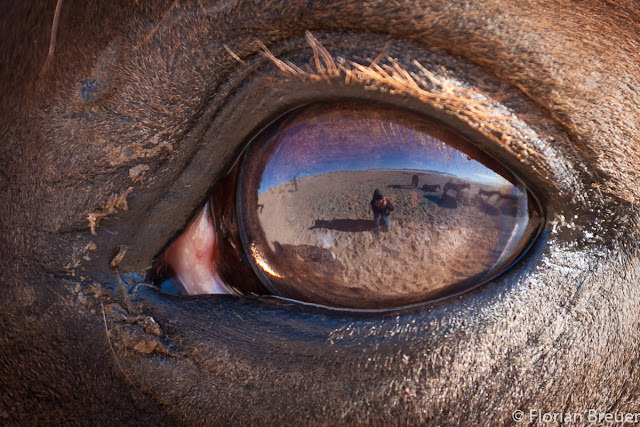 What I like about the title picture is that it reflects - literally - the horse's life and environment. Reflected in the perfect optical surface of the eye you can see the bleak desert which is their home, the endless blue sky, as well other members of the herd relaxing nearby. Of course, the image also contains the photographer (so it's also a self-portrait) as well as one other photographer in the background. Here is just a short post, I'm currently at a conference in Göttingen and will fly back home tonight. This pretty picture was taken during the Aus workshop in Namibia that I mentioned earlier. We were coming back from a day trip to the dunes of the Namib and ran a bit late (a recent flood had damaged the road) so we were still out somewhere on the Garub Plains when sunset came. Using a long focal length, the landscape is strongly compressed, leading to a profusion of horizontal lines in the image, which contribute to the peaceful atmosphere. I also like how the mountains in the top right mirror each other. Maybe this would be even better if the little double hill in the foreground was on the right hand side of the image, but I decided not flip the image around. In fact, I used almost no post-processing besides cropping into a wide format (in part to remove some unsightly foreground). 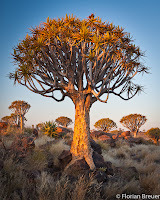 In unrelated news, my Quiver Trees by Night 2 appeared on the MyPhotoSchool blog. That's all I wanted to share, have a lovely weekend. 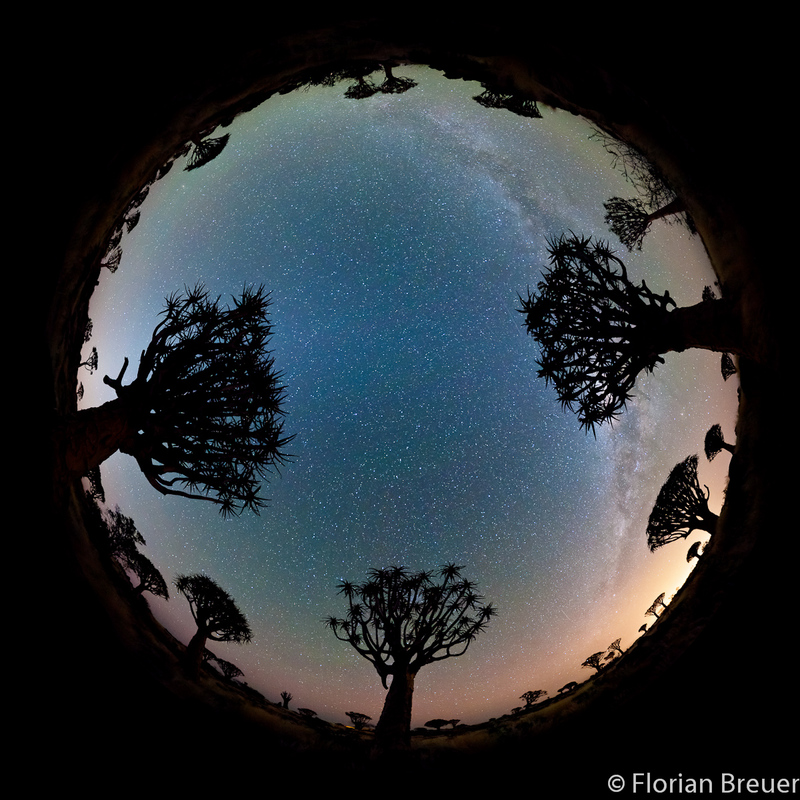 Here is another night sky panorama from the Quiver Tree Forest near Keetmanshoop, Namibia. I prefer this composition to the previous one, it looks more balanced overall, even though more of the Milky Way is occluded by the nearest quiver tree. I also brought out some detail in the foreground, which adds to the atmosphere. This image attracted some attention at this week's meeting of my local photo club, so I've decided to write a post detailing the making of this image. I already wrote about shooting these panoramas in my previous post, though I probably downplayed how much I stumbled about in the dark, knocking my camera into things and almost lost my cable release. 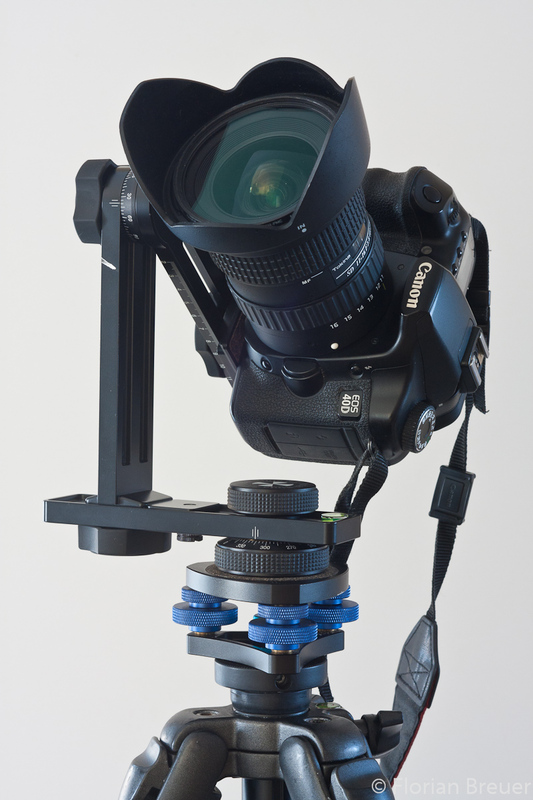 Anyway, here's a picture of my camera on its nodal point adaptor. As you can see, all camera movement is centred on a point just inside the front element of the lens, the nodal point. I made a total of 16 exposures, covering the whole sky, each 30 seconds at f/2.8 and ISO 3200. The full sky pano is shown on the right, but somehow doesn't look so special. For the final panorama I only used 12 of the exposures, covering the right two-thirds of the full sky view. Here you can see the 12 exposures imported into Lightroom (the last four pointed straight up, two would have been enough). I apply some basic adjustments: firstly I correct for some lens defects (for some reason, I can't seem to import the profile of the Tokina 11-16 into Lightroom, so the corrections are done manually and then saved as a preset. That works fine), usually only chromatic aberrations, which are a weakness of this lens. Distortions will be handled by the panorama software. The basic adjustments I make are some additional brightness as well as a slight boost to clarity and vibrance. White balance is set to about 3600K, I basically experimented until I got a clear separation of colours between the glow of the town lights and the stars. At this point I also apply some strong noise reduction, as this is at my camera's highest ISO setting. Once I'm happy, I export the files as 16bit TIFs and fire up Hugin. 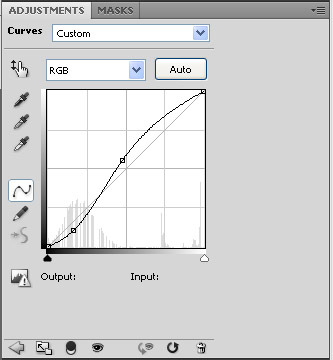 16 bits means that each of the three colour channels contains 16 bits (instead of the usual 8 bits of jpg files). 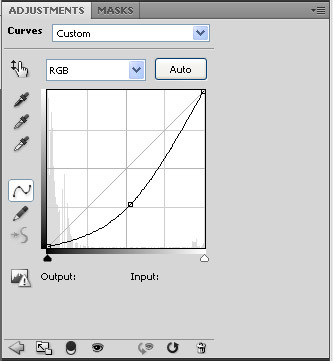 This allows for more leeway later when adjusting colours, contrast, etc. without producing banding. The camera captures 14 bits per channel, so I would lose quite a lot of information if I converted to 8 bit channels at this stage. Hugin is a very powerful panorama program, and can do just about anything. It's also free. Just in case you think this is too good to be true, well, it is rather cumbersome to use (it was written by geeks for geeks), and it sometimes takes a while before somebody gets around to fixing bugs. In fact, the latest version has a bug that crashes the fast panorama previewer, unless you manage to turn off the little overview window before it crashes. So you've already seen the 12 shots in lightroom. Hugin now finds control points linking them together (the latest version does this very well, older versions needed you to download and install 3rd party software - usually encumbered by patents - for this). Control points are basically pairs of points on different images which are supposed to overlap in the final panorama. The program is quite good at detecting these automatically, especially with night skies. Once you're happy with your control points, hugin starts calculating how best to move and transform the images to fit all the control points together. 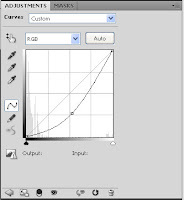 Besides relative placement of the images, hugin can also play with various parameters defining lens distortions, which are thus automatically corrected. This means that you can use lenses with very bad distortion - even fisheyes - to make your panorama. Once hugin has figured out where to put each image, and how to distort them, you get to play with the previews. Here you can choose the type of projection you want (from a bewildering list) and generally play around shifting and twisting the panorama until you have the framing you want. Here's a screenshot from the fast previewer, where I've selected an equirectangular projection and chosen a crop. Hugin also adjusts the exposure of each image, if necessary, and corrects for lens falloff in such a way that you really can't see any transition between the various images. 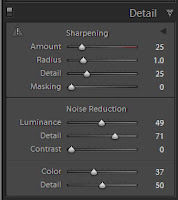 You can even load images with vastly different exposures to create HDR panoramas. When you're done playing with the previewer, you tell hugin to get to work and actually produce a final image. Then you go off and take some more photos, because this can take a while, especially on my anaemic little laptop. What I'm describing here is the ideal scenario. Of course, things can go wrong at every step, most commonly with the aligning of control points. 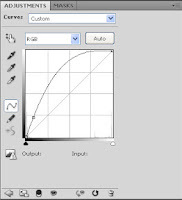 The most common source of trouble is parallax error - when foreground objects move relative to the background as you move your camera, unless of course you're moving it around its nodal point. This matters most with foreground that's very close. Another problem is when things in the image move between shots, such as leaves in the wind, and clouds. And stars, of course, though I find this is usually not a problem in practise. Okay, once hugin has produced a huge 16bit TIF file, it's time to import that into photoshop for the final touches. I often do a little bit of cloning to magic away telephone cables, etc. For this image I only had to remove a few hot pixels (bright points that appear during long exposures, especially at high sensitivity. One can also get rid of these with dark frame subtraction, but you don't want to waste too much time between shots). 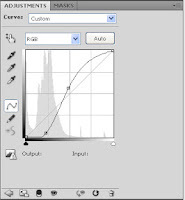 For this image, the main adjustments were via curves. Here you see a list of layers used for this image (the white layer at the bottom was only used to produce a white border for printing, ignore it). The image itself is layer 0, which is basically what hugin produced. 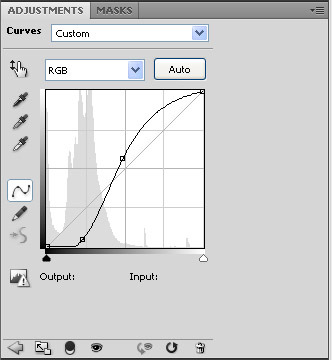 Above that are 4 curves adjustment layers, each with a layer mask, so that it only applies to specific parts of the image. 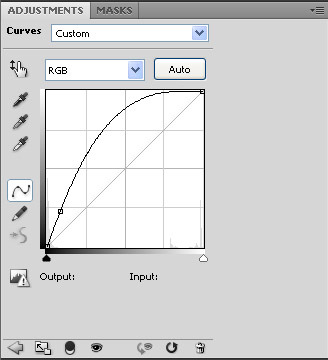 This is the first curves adjustment layer. 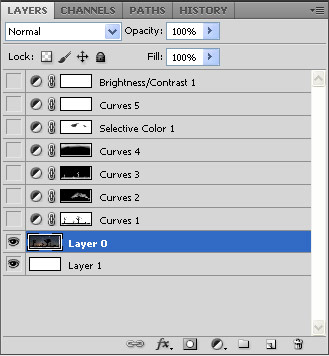 You can see from its mask in the layer list above that it applies to the sky and not the foreground. Basically, I have greatly increased the contrast in the sky to better bring out the stars. Layer 2 increases the contrast a little more just on the Milky way itself. Layer 3 lightens the foreground. This is illuminated by starlight and that little bit of light pollution, so it's very faint. I'm frankly surprised that there's any detail here at all, as it is the grass and rocks look vague and dreamy, so I'll just stick out my chest and pretend that was on purpose. It does add a little atmosphere. Layer 4 darkens the top part of the image, which arguably prevents the viewer's eye from leaving the image. Its value is debatable. The nice thing about adjustment layers in photoshop is that you can turn them on and off on a whim. I decided to keep this on. So what's left? There's a very minor selective colour adjustment, where I tweak the colours a bit, but you can barely see the difference, and ultimately I could have left this out without ill effect. The remaining two layers increase the overall brightness a bit more (I have both a slight curves adjustment and a direct brightness adjustment for this). The impact of this image depends a lot on how much of the faint foreground you can see, which is why it looks much better on a well calibrated screen. If you want to see what I mean, dial up the brightness of your screen now, while turning down the contrast. Of course, if your screen is already calibrated you'll hardly follow my instructions here, but for the rest of you, know that most screens come out of the box with contrast set too high so that they look snappy in the shop. Anyway, as a result this image is also a bit hard to print, and one really needs to softproof it beforehand, and then play with these final two layers to make the softproof look the way you want it. Here are the pre- and post-photoshop images for you to compare. Now the image is complete, and is ready to be released into the wild. It met with success in the I-shot-it competition ($10, yay! 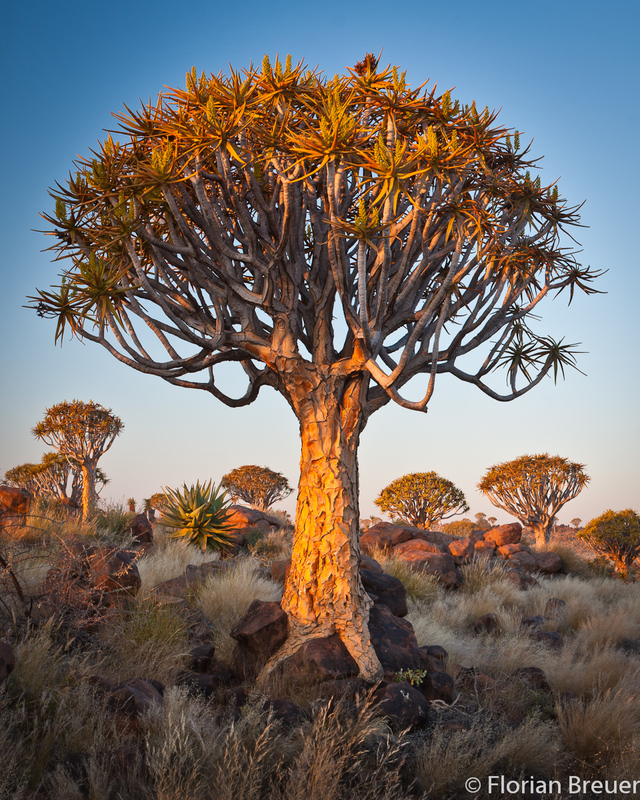 ), and also appeared on Earth Shots, which I'm very proud of. Hope you enjoy it! Please feel free to leave comments.